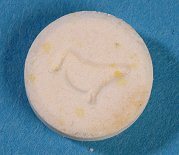 The appearance of ecstasy varies considerably with there being a wide range of coloured pills and capsules often marked with designs and logos. This can result in some ecstasy pills getting nicknames e.g Mitsubishi’s, teddy bears and Superman pills. Pure ecstasy takes the form of a white powder. It is known as MDMA which is short for 3,4 Methylenedioxymethamphetamine. Although police seizures of MDMA powder have increased in recent years, it remains less common than ecstasy tablets or capsules. Ecstasy is also very occasionally sold as crystals. Some pills also have pictures, designs or logos on them. Ecstasy pills are usually taken orally. They may be crushed up into a powder and snorted. Powder can also be wrapped in cigarette paper and swallowed. Among young people (16-24 year olds) ecstasy is the second most popular drug after cannabis. It is the third most popular drug, after cannabis and cocaine, for 16-59 year olds. According to Home Office statistics The level of ecstasy use by adults aged 16 to 59 in the 2015/16 survey (1.5%, or 492,000 people) was similar to the previous year (1.7%), and to that seen in the 1996 survey year (also 1.7%). Generally, the proportion of 16 to 59 year olds using ecstasy in the last year has been relatively flat throughout the lifetime of the survey, fluctuating between 1 and 2 per cent since measurement began in 1996. In the 2015/16 survey, the proportion of 16 to 24 year olds reporting ecstasy use was 4.5%, equating to around 279,000 young adults. This appears to be lower than the 2014/15 estimate of 5.4%, but the difference is not statistically significant. The majority of ecstasy users only take the drug once or twice a year. Frequent (more than once a month) use of ecstasy has shown a general downward trend since the 2003/04 survey. In the 2003/04 survey, the proportion of ecstasy users who were frequent drug takers was 20.2%. This has decreased to 7.0% in the 2015/16 survey. For some while, it has been clear that many tablets sold as ecstasy are not what purchasers think they are. The amount of ecstasy in a tablet can vary greatly. Tablets have been analysed and some contained no ecstasy but other drugs such as amphetamine or ketamine. Others have been found to contain some ecstasy but mixed with other drugs or a range of adulterants. There have been many reports in the media that ecstasy is getting stronger. A study from the European Monitoring Centre on Drugs and Drug Addiction (EMCDDA) from April 2016 looked at this issue. 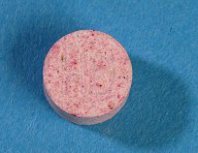 They state that in the 1990s and 2000s the average MDMA content of tablets was somewhere between 50–80 mg, as reported by drug checking services and forensic institutes. 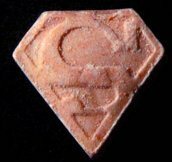 Currently, however, the averages are closer to 125 mg MDMA per tablet, while there are also ‘super pills’ found on the market in some European countries with a reported range of 270–340 mg. There are reports of large variations in the dosage in similar looking tablets. The price of ecstasy has fallen. When the drug first hit the dance scene, a pill typically cost £25. Today, prices have fallen to as low as £5, depending on the quantity of pills bought and their quality. Ecstasy is controlled as a Class A drug under the Misuse of Drugs Act. It is illegal to be in possession of the drug or supply it. Ecstasy cannot be prescribed by doctors. The maximum penalties for possession of ecstasy is 7 years imprisonment plus a fine and for supply is life imprisonment plus a fine. In practice, maximum sentences are rarely used. For more information please see the sentencing page on the Release website. Ecstasy is a stimulant drug which also has mild hallucinogenic effects. It has been described as being like a mix of amphetamine and a weak form of LSD. The effects of taking a moderate dose start after 20-60 minutes (longer if on a full stomach) and can last for up to several hours. Physical effects include pupil dilation, jaw tightening and an increase in body temperature, blood pressure and heart rate. As with amphetamine there is often a loss of appetite. Users may also experience a period of nausea. Many users experience an initial rushing feeling followed by a combination of feeling energetic and yet calm. Loss of anger, empathy with other people and an enhanced sense of communication are commonly reported. Some users also report a heightened sense of their surroundings, greater appreciation of music and increased sexual and sensual experience. Some users have bad experiences. This may include feeling anxious and panicky, confusion and unpleasant distortion of the senses, that may, in some manner or other, last for days, even weeks. This is more likely if users take high doses or are already feeling anxious. The disorientating effects of ecstasy may make accidents more likely. A number of ecstasy-related deaths have been connected with non-stop dancing in hot, crowded clubs leading to overheating and dehydration. Taking a break from dancing, cooling down and sipping water regularly and slowly (one pint over an hour) can help prevent this from happening. After taking ecstasy users may feel very tired and low and need a long period of sleep to recover. This may last up to three or four days and is known as a comedown. Regular ecstasy use may lead to sleep problems, lack of energy, dietary problems and feeling depressed or anxious. Increased susceptibility to colds, flu, sore throat etc may follow. While physical dependence is not a problem, psychological dependence on the feelings of euphoria and calmness and the whole scene around ecstasy use can develop. Short term mood changes such as the ‘mid-week hangover’ following weekend use, and impairments in short term memory function may be considered as some of the milder consequences of MDMA use. There have been indications of liver damage in some ecstasy users, but it is unclear whether this is a more immediate consequence of heatstroke, or due to toxicity over the longer term. The exact functional consequences of MDMA neurotoxicity, i.e., the cognitive, behavioural and emotional changes in users, and their severity, especially in the longer term, are as yet not clear. Researchers agree that ecstasy use can deplete levels of serotonin and, in some cases, have an impact on certain areas of the brain. However, there is no agreement that these effects of the drug constitute irreversible ‘brain damage’ that will impact the user in years to come. Some research has also suggested that prolonged ecstasy use, particularly at high doses, can cause a degree of memory deficiency and periods of depression. Every year there are around ten deaths in the UK where ecstasy is recorded on the death certificate. There is no way to know what is in an ecstasy pill unless you can get it tested. Information from testing centres suggest that ecstasy is getting stronger so the advice is to start low and go slow – e.g. begin by taking a quarter of a pill and wait an hour or two to see the effects. This advice is reiterated in the CrushDabWait campaign, where users are encouraged to crush their pill, dab in a wet finger, swallow and wait to see how strong the effects are. If possible get the tablets tested. Testing facilities are becoming increasingly available at festivals and clubs. Take regular breaks from dancing to avoid the dangers of overheating and dehydration. Relax somewhere cool and sip water or another non-alcoholic drink slowly (one pint an hour). Do not drink too much as this can also be dangerous. Drinking too much or too quickly affects your body’s salt balance. If you have a heart condition, high blood pressure, liver problems, asthma, epilepsy or diabetes you can be at increased risk of bad reactions to ecstasy, so it is best avoided. As with all drugs it is best not to use ecstasy alone but to be with friends you trust and who preferably know some first aid. Always seek medical attention if you are worried about your or a friend’s reaction to ecstasy. Ecstasy was first made by two German chemists in 1912 and patented in 1914, in case it turned out to be a useful drug. It didn’t. 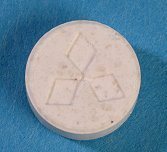 During the 1950s, the American military experimented with a whole range of drugs, including ecstasy, for use in chemical warfare, to extract information from prisoners and to immobilise armies. In the 1960s, the drug was rediscovered’ by an American research chemist Alexander Shulgin who experimented with it on himself. Ecstasy has a strange property in that it can make users feel in tune’ with each other. Because of this, some American therapists, especially those seeing couples whose marriage was failing, administered the drug to help couples be more willing to see the other person’s point of view. Some therapists in Switzerland still prescribe the drug in this way. However, some tests on rats which indicated that ecstasy might damage the brain in some way, led it to being banned in the USA in 1985. Error: Error validating access token: Session has expired on Saturday, 03-Nov-18 03:39:19 PDT. The current time is Friday, 19-Apr-19 14:20:42 PDT.